^ 1.00 1.01 1.02 1.03 1.04 1.05 1.06 1.07 1.08 1.09 1.10 1.11 1.12 1.13 Shapiro, ED. Clinical practice. Lyme disease.. The New England journal of medicine. 1 May 2014, 370 (18): 1724–31. PMID 24785207. 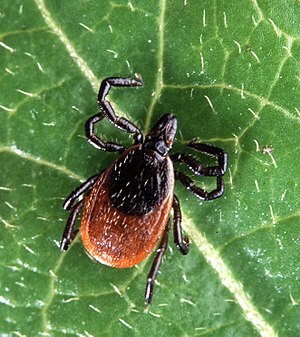 ^ 2.0 2.1 2.2 Signs and Symptoms of Lyme Disease. cdc.gov. January 11, 2013 [2 March 2015]. ^ Johnson RC. Borrelia. (编) Baron S, et al. Baron's Medical Microbiology 4th. Univ of Texas Medical Branch. 1996. ISBN 0-9631172-1-1. PMID 21413339. ^ 4.0 4.1 Lyme disease transmission. cdc.gov. January 11, 2013 [2 March 2015]. ^ 萊姆病，不會人傳人. 衛生福利部疾病管制署. 衛生福利部疾病管制署. 2012-12-28. （原始内容存档于2016-04-20）. ^ Lyme Disease Diagnosis and Testing. cdc.gov. January 10, 2013 [2 March 2015]. ^ Two-step Laboratory Testing Process. cdc.gov. November 15, 2011 [2 March 2015]. ^ Testing of Ticks. cdc.gov. June 4, 2013 [2 March 2015]. ^ Tick Removal. cdc.gov. June 23, 2014 [2 March 2015]. ^ Regional Disease Vector Ecology Profile: Central Europe. DIANE Publishing. April 2001: 136. ISBN 9781428911437. ^ Berger, Stephen. Lyme disease: Global Status 2014 Edition. GIDEON Informatics Inc. 2014: 7. ISBN 9781498803434. ^ Willy Burgdorfer - obituary. Daily Telegraph. 1 December 2014 [1 December 2014]. ^ Post-Treatment Lyme Disease Syndrome. cdc.gov. August 11, 2014 [2 March 2015].